While upgrading medical imagining equipment is exciting, it takes a lot of planning to avoid potential pitfalls. If you don’t do it right, you could experience cost overruns, employee frustration and patient dissatisfaction. The better you plan, the more time and money you can save—and the more headaches you can avoid! Here is a list of 8 tips that can make the upgrading process easier for you and your team. Select The Right Equipment. This will take a team effort. You’ll need to make sure it makes business sense to upgrade your equipment. You’ll need to consult with system users and key clinical stakeholders. Once you’ve determined which equipment makes sense, it’s time to talk to your facilities team, building maintenance electrical plumbing experts, engineering and structural experts. You’ll also need to consult with an architect, designer and a radiation safety officer. Make sure the entire team works together from the beginning. You’ll avoid a lot of obstacles, be able to overcome challenges and control costs. Examine Your Workflow. 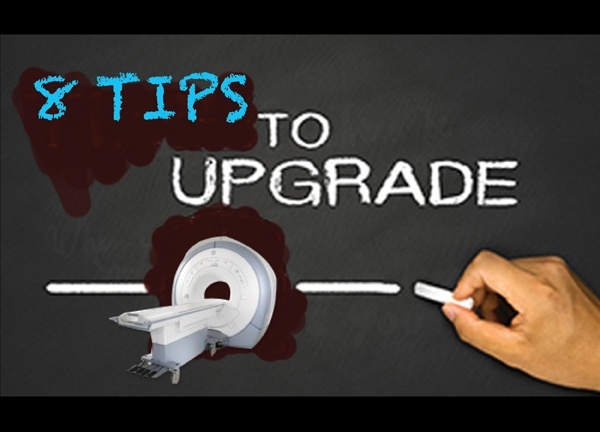 When you upgrade your medical imaging equipment, it can affect your current workflow and staffing. You’ll want to consider making adjustments to your workflow patterns to maximize patient and staff satisfaction. There are probably recent innovations and cost-saving approaches that can have a positive affect on your operations. By examining these options in advance, you can increase patient comfort and reducing stress while updating your equipment. Determine The Best Design. You’ll want to select an architect or design professional to help map out the scope of the project, design a plan and execute it. They can project costs and time lines. An Interim Plan Is Essential. You’ll need an interim mobile modality in order to maintain patient volume while you update your equipment. While a mobile trailer is an ideal interim solution, you have to make sure you have a concrete pad that can handle the mobile trailer, as well as proper exterior power connections. You’ll also need to make sure there is adequate space for delivery and installation of the mobile modality unit. Create A Project Timetable. There are so many moving parts to a project of this stature, and that means there’s an opportunity for many things to go wrong! Proper planning and scheduling can save time and help you avoid a lot of construction cost overages. Establish A Realistic And Accurate Budget. You’ll need to include all direct and indirect costs in your budget, and continue to refine the budget throughout the project. You’ll want to establish cost control and contingency plans so you’re prepared if there are unexpected costs during construction. Create Detailed Plans For Construction. When you’re upgrading medical imaging equipment, there are often special construction needs and upgrades for shielding, UPS and chilled water systems, to name a few. You’ll need to arrange for shielding testing before and after equipment delivery and plan for emergency backup systems for MEP systems in order to minimize equipment downtime. There are so many details, like isolating the project area from the rest of the department, so patients and personnel aren’t negatively impacted. The more you plan upfront, the better off you’ll be. Seek Advice From Industry Professionals. When you work with a reputable and experienced medical imaging equipment supplier like Atlantis Worldwide, they can help you prepare and plan for the installation of the equipment. We’re happy to share our knowledge and expertise—we’ve help clients navigate major installation projects for decades and are happy to help you, as well. Contact one of our experts today!